Jason Birch's work at the City of Nanaimo was featured on CTV in Canada this morning. If you want to see what an innovative person can do on an open source web platform, you can access the video recording at Jason Birch on CTV . This has been really one of the most interesting conferences I have been to. This morning we listened to Jack Pellicci, late of Oracle, and more recently with Intergraph reiterate his slightly modified message "Don't make geospatial special." And then right after that, John Christy of the UN IPCC provided a very int eresting and radically different perspective on global climate change (Rocket City Keynote ). For a more mainstream perspective on the IPCC report, see (Susan Solomon). And all this occurred 100 m from one of the most incredible and historic space museums US Space and Rocket Centre in the world. Huntsville was where about 118 German scientists and engineers led by Werner von Braun ended up after the war and ultimately built the Saturn V rocket - and you really have to stand next to this to appreciate just how huge this is - that incredibly never had a major failure and put a man on the moon. 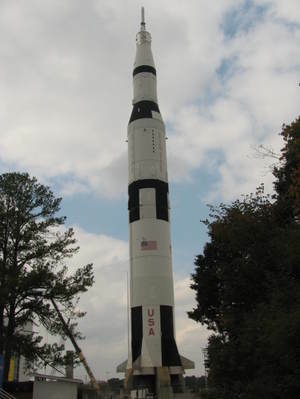 I'm in Huntsville, Alabama for the Rocket City Geospatial Conference where Neal Ni emiec and I will be running a lab today on Creating Web 2.0 applications on an open source platform, I'll be talking later in the week on Web 2.0, Open Spatial Data Access, and Open Source Geospatial Software and Darren Dambly will talk about 3D Visualization in Urban Training and Planning. There are going to be interesting speakers tomorrow and Wednesday including Dr John Christy of the University of Alabama here in Huntsville. Dr Christy is the lead author of the U.N. Intergovernmental Panel on Climate Change, which together with Al Gore won the Nobel Peace Prize last Friday. "The University of Alabama-Huntsville has one of the few research centers which actually builds from scratch the types of datasets which describe variations and trends in climate. These may come from digital counts of satellite sensors, to individual balloon ascents to long-dormant dusty files of African weather data in a British library." Should be interesting. Are Paper Maps a Thing of the Past ? That's only about a 7% drop. So many people rely on GPSs in their vehicles and Google Maps, MapQuest, or other on-line services for navigation that I wonder what people are doing with all these paper maps - maybe using them for wallpaper ? Al Gore and the U.N. Intergovernmental Panel on Climate Change won the 2007 Nobel Peace Prize it was announced today in Oslo because of their role in raising the awareness about global climate change. This is going to significantly increase the pressure on governments, industry, and you and me to move even more rapidly to reduce emissions and achieve what is referred to as carbon neutrality. I just saw this Sinking Ferry on Jason Birch's blog. It just shows you the artifacts that can be created if you're not too concerned with the quality of your data. An interesting report A Study of the Status of Full Cost Recovery and Sustainability of Ontario Municipal Water and Wastewater Systems was released last week by the Ontario Sewer and Watermain Construction Association, an industry association. The OSWCA commissioned a study of a representative sampling of municipalities across Ontario including Ottawa, Hamilton, Barrie, Belleville, Port Colborne, Niagara Falls, Thorold, Chatham-Kent, Niagara Region, Halton Region, and Wainfleet Township with a combined population of over 2.3 million people, or about 19 per cent of the population of Ontario. The study found that crumbling underground pipes in some areas are causing leakage rates as high as 30 per cent and estimates that leakage is costing ratepayers more than $160 million a year across the province. At FOSS4G last week I discovered that the Brazilian Space Agency INPE (Instituto Nacional de Pesquisas Espaciais) has become a sponsor of OSGeo. Also INPE has submitted TerraLib as an OSGeo incubator project. I have attended most of the GeoBrasil conferences in Sao Paulo over the past few years so I am aware of INPE and Terralib, which has a reputation in Brazil as a high quality geospatial library, but which is not as well known as it should be outside of Brazil. I expect that as a result of INPE joining the OSGeo, TerraLib and TerraView will rapidly become better known. TerraLib has an English web site, and I have been told that there will be an English web site for TerraView soon. If you're not familiar with TerraView, TerraView is TerraLib with a GUI. Adena Schutzberg of Directions Magazine offers interesting background (Adena on Mentor Software ) on Mentor Software and Norm Olsen. I recommend you look at the comments to Adena's article. They illustrate the benefits of the web, what Eric Raymond called "many eyes." Following quickly after the proposed acquisition of Tele Atlas N.V. by TomTom N.V. (TomTom Offer), it was probably only a matter of time before someone acquired Navteq. Today Nokia announced that it has agreed to buy Navteq (Nokia buys Navteq). I would see this as just another example of location being integrated into the broader spectrum of IT. In the last year Pitney Bowes acquired MapInfo, and Leica acquired Acquis, Ionic, and ER Mapper.